Bladder cancer is caused when changes or mutations in the genes of normal bladder cells make them grow abnormally. Most gene mutations related to bladder cancer are acquired during a person’s life, and inherited gene mutations are not thought to be a major cause of this disease.3 Acquired gene mutations can be random or they can be a result of exposure to cancer-causing chemicals or radiation, such as tobacco smoke and other chemicals. For more information on bladder cancer signs, symptoms, diagnosis, staging, and treatment options, visit the American Cancer Society’s website. Share our infographic on bladder cancer to help raise awareness for this disease. Bladder cancer statistics. World Cancer Research Fund International Web site. http://www.wcrf.org/int/cancer-facts-figures/data-specific-cancers/bladder-cancer-statistics. Accessed May 10, 2017. Worldwide data. World Cancer Research Fund International Web site. http://www.wcrf.org/int/cancer-facts-figures/worldwide-data. Accessed May 10, 2017. What causes bladder cancer? American Cancer Society Web site. https://www.cancer.org/cancer/bladder-cancer/causes-risks-prevention/what-causes.html. Accessed May 10, 2017. Key statistics for bladder cancer. American Cancer Society Web site. 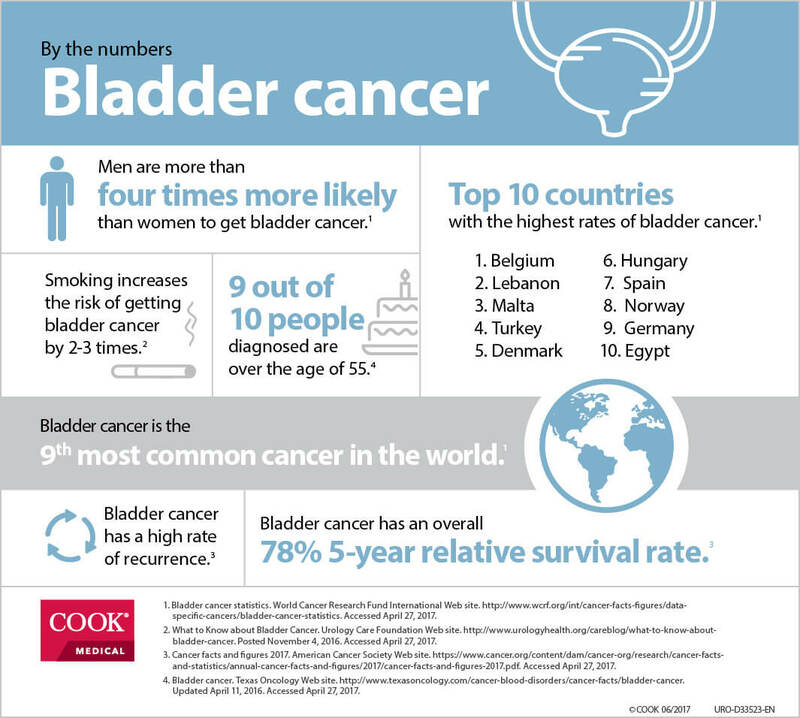 https://www.cancer.org/cancer/bladder-cancer/about/key-statistics.html. Accessed May 10, 2017. What to know about bladder cancer. Urology Care Foundation Web site. http://www.urologyhealth.org/careblog/what-to-know-about-bladder-cancer. Accessed May 10, 2017. Bladder cancer risk factors. American Cancer Society Web site. https://www.cancer.org/cancer/bladder-cancer/causes-risks-prevention/risk-factors.html. Accessed May 10, 2017.